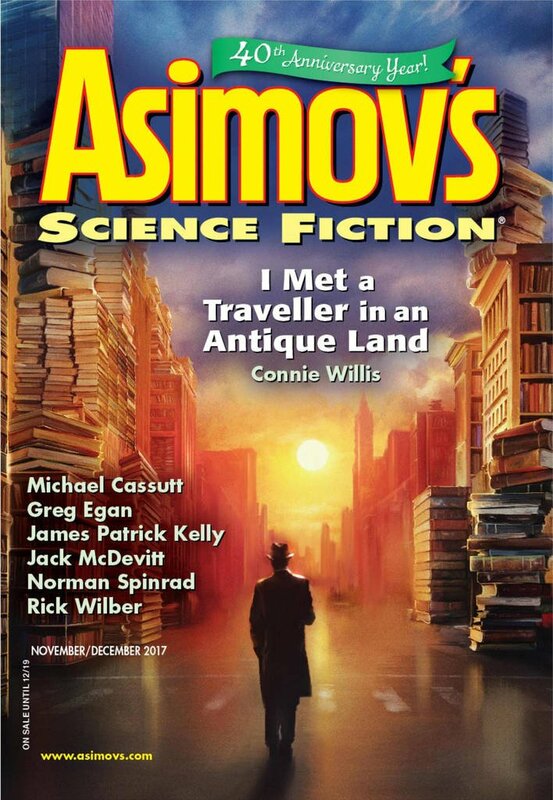 "Confessions of a Con Girl," by Nick Wolven [bio] (edited by Sheila Williams), appeared in Asimov's Science Fiction issue 11-12|17, published on October 19, 2017 by Penny Publications. Pro: Sophie makes a great unreliable narrator. No matter how she spins things, we get a pretty clear picture of what really happened. The irony of the story is that she really bought into the “support other people” propaganda at the heart of her society—misled by the huge positive response to her handling of the autistic boy. But the real truth is that it’s not about helping people who struggle to get along with others. It’s about knowing when to join the “Pro people” in hating the wrong sort. It’s about supporting the right kind of people and excluding the rest. Failure to learn that is what ruins her. Sophie is hardly blameless; she’s so eager to repeat her success with the autistic boy that she tries the same thing with other undesirables. She’s not really trying to help anyone but herself, and she pays a heavy price for it. Even so, she shows us that she's better than the people who put her in this situation. This makes her a tragic hero of a sort. We root for her despite her flaws, even though we see that those flaws inevitably lead to her ruin. Con: The anti-PC message is a little too heavy. For example, she’s punished for hugging the councilor as if she’d assaulted him. Sophie is the only real character in the story which makes for a rather simple plot line.